St John’s House at Warnford sits adjacent to the church of Our Ladye of Warneford. 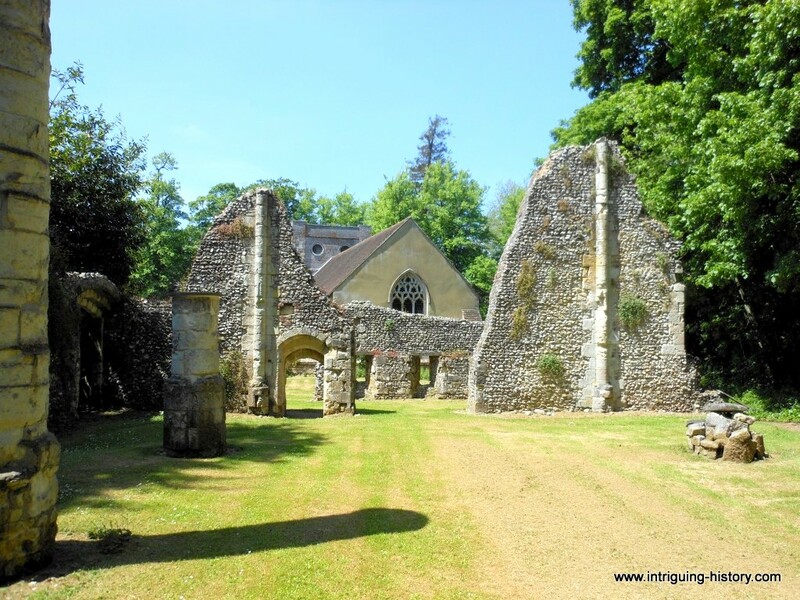 This ancient church with it’s origins in the Saxon period occupies an idylic spot in the Meon Valley, nestled in woodland alongside the River Meon. Tucked in behind it, a very rare example of a C13th aisled manor hall lies in ruins. The house was built in c.1209 by a family called St John, who were related by marriage to the very important de Port family. Adam de Port b.1151 was married to Mabel heiress of Oval and her mother was of the St John of Halnaker. Their son John, took the surname St John. Adam de Port had rebuilt the church in stone in 1190 and then built themselves a three bayed aisled hall. The thick flint walls were dressed in stone and magnificent, stone dressed columns, loom upwards, giving a very clear vision of how important this house and therefore this family must have been. The holes for the upper floor joists are clearly visible. The house has at times also been called King John’s House.